You’ve always kept a sharp eye on your key performance indicators (KPIs), but did you know that optimizing your revenue per visitor (RPV) can accelerate the growth of your eCommerce business? If you’re looking for ways to improve RPV for your eCommerce site, read on and we’ll share some key changes you can make on your site today. RPV measures the revenue from each unique visitor who enters your eCommerce site and is the ultimate test of the health of your eCommerce shop. It’s a composite of two commonly used metrics, conversion rate (CR) and average order value (AOV). The combination of the two metrics shows you what’s driving revenue and eliminates the common blind spots associated with CR or AOV. Conversion rate measures the percentage of visitors who make a purchase from your site. Simply calculated, it’s total purchases divided by total customer visits. This measurement tracks all purchases equally, regardless of the purchase price—which is where the blind spot of CR lies. By weighing all purchases equally, CR falsely attributes the same conversion value to every customer (e.g. a $2 purchase is considered the same as a $500 purchase), leading to incomplete sales data on a customer’s actual spend. Average order value fills some of the gaps of CR by measuring the average amount per purchase made on your site. AOV is the dollar value of sales divided by the total purchases. It doesn’t, however, track purchases (conversions) made per visitor; therefore, AOV can’t entirely replace CR. And that’s where RPV comes in. To calculate RPV, simply divide the total revenue earned during a determined time period by the number of visitors during the same period. Say, for example, you earned $10,000 during the month of April and had 5,000 visitors during the same month. Your RPV for April would be $2 (or $10,000/5,000). By accounting for both revenue and visitors, RPV provides a healthy pulse of your eCommerce business by uniquely taking into consideration both the number of visitors and spend in one metric. In the Mobile Optimization Initiative, a Magento Community Initiative, Magento System Integrators have been performing optimization experiments to uncover ways to improve mobile conversions. Leveraging the power of community, we are able to collectively and continuously test and optimize at a pace and volume that individual merchants simply could not achieve. Some interesting findings related to RPV have been uncovered, and we encourage you to give some of them a try. For instance, working with 12 System Integrators performing tests across over 60 merchant sites, we have found that two experiments, Security Icon on Checkout and PayPal Express Buttons, have presented the most dramatic RPV lift so far. Sometimes the simplest changes yield big results. In this case, we simply traded out the shopping cart icon for a security icon. Added to the checkout process, a Security Icon shows shoppers that the site they’re using follows stringent encryption security measures. The use of the Security Icon had an enormous lift on mobile RPV. Given the pressing concern of security amongst mobile shoppers, the security icon appears to increase shopper confidence when making mobile purchases. If your mobile RPV could use some help, this simple optimization experiment could decrease shopping cart abandonment and boost your revenue. On mobile devices, ensuring a fast checkout process is critical. 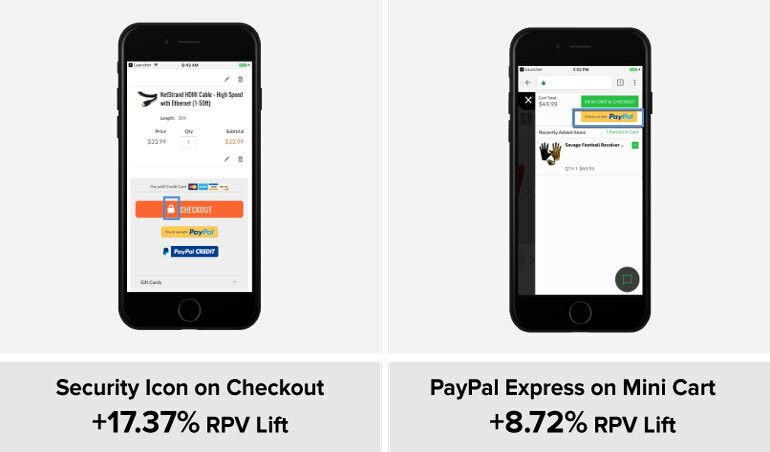 The application of the PayPal Express button had a positive lift on RPV when placed at various stages (cart, mini cart, and even higher up on the product details page) of the checkout process. The PayPal Express button appears to address consumer desire for quick (and secure) shopping by simplifying the payment process and requiring only two steps to complete the purchase. Effective optimization strategies for eCommerce sites will vary from merchant to merchant. Look at all stages of the shopping experience and identify ways to improve conversions. Focus on RPV to measure your efforts and keep on experimenting. For more ideas and results of optimization testing, visit the Mobile Optimization Initiative.